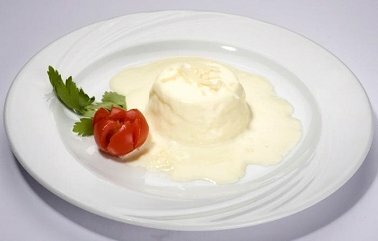 To prepare the sformato, begin by beating the egg whites and gently combine with the squacquerone cheese and cream. Pour the mixture into pre-buttered moulds, position on a tray with high sides and oven cook in a bain-marie at 85°C for approximately 1 hour. To prepare the fondue, melt the butter in a pan, add the flour and stir. Remove the pan from the heat and add the milk and grated Fossa cheese, taking care to mix them well. Return the pan to the heat and cook until the sauce begins to boil and thicken. Add a pinch of salt. Bring to the boil and reduce. Serve the sformato cold, generously topped with the Fossa cheese fondue. Sformato with Fossa Cheese Fondue is one of the many recipes using the wonderful foods that you can find in the Emilia Romagna region of Italy. These range from the delicate prosciutto of Parma to the distinct balsamic vinegar of Modena, but cheese is where this region really shines.